Boy, do we like putting "Gowanus" and "parrot" in the same phrase. Yesterday, after we posted an item about the parrots in Thomas Greene Park, a number of readers left comments that fill in some valuable blanks. As it turns out, parrots have been seen in and around Gowanus for a while. 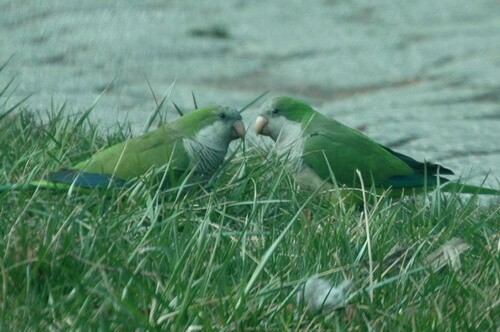 There is also a lot of parrot activity in J.J. Byrne Park on Fifth Avenue in Park Slope. There are several theories about why the parrots are moving to Park Slope and Gowanus--other than an interest in real estate. There is a very active Red-Tail hawk in Green-Wood (who apparently also hunts with a Falcon) and the parrots appear to be using the Slope as a relatively safe refuge. But they go home each night to their main colony -- I have yet to see any evidence of nest facilities being constructed by the parrots in Park Slope. i've been seeing/hearing the parrots in my neighbors' backyards on 10th street between 3rd and 4th avenues for the past few months. there are a few big trees back there that they like to perch in. i've been trying to get a picture of them to send into this blog, but they've remained elusive when i've had my camera on me. they do drive my cats nuts, though! funny thing is, this isn't the first time we've had "tropical" birds in gowanus...the guy who used to own the antique/junk shop and the watch repair shop on 3rd between 10th and 11th used to keep about 10 parrots and macaws in cages in his back yard; it sounded like a jungle during the day! he left a few years ago, so it was really funny to hear squawking again when these new guys came around. Apparently, the birds are also being drawn by apples, which they really like to eat. The owners of the laundromat on the corner of 13th street and 4th avenue (right next to the giant 12 story condo development that has gone up terrifyingly fast) keep a few mccaws in cages around to keep you company while you wash your underpants. It is kind of amusing. And disconcerting. I'd rather have shops with quirks—and quacks!—like that then having a sterile environment with no personality. Waiting for the day a parrot ends up in my Boerum Hill backyard.